Mas found this stone in the early 1990’s on the Eel River. It was getting dark at the end of a long day of tanseki (stone collecting). He was getting ready to go home when he saw the little red peak sticking up above the sand. He tried to move it with his crowbar, with no particular expectation of anything. Usually when you try to move a buried stone you find you can’t – the hidden part is too big or it’s stuck under other large rocks. Then, if you can dig it up, it turns out to have no shape or some other big problem. But this stone came out very easily, and when he picked up the stone to look at it he just said "ワオー" (Wow!). It was such an incredibly beautiful stone, he says he couldn’t believe it. The deep red jasper mountain range rising up behind the lake in the long valley gave him such a peaceful feeling. If you’ve been on tanseki, perhaps you know that feeling of joy and excitement; Mas likens it to finding some precious jewel. 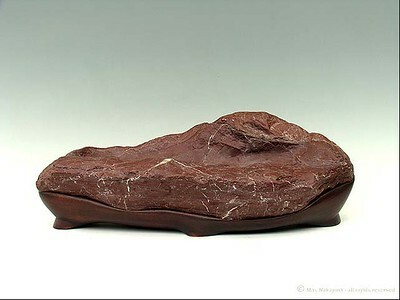 He made a daiza for this stone following the traditional style taught by California (and also Japanese) suiseki artists. A seat is carved into the wood to hold the base of the stone (this stone has not been cut, so the base is not flat), small uniform legs are made under the major visual masses, and the rim is flat all the way around. In this style, the daiza acts as a simple platform for the stone. The legs show just enough to visually support the weight of the stone, but otherwise are intended to almost disappear from the normal viewing angle (which is looking down slightly on the stone). The idea is to show the stone, the daiza itself is not considered important. At about this same time Mas was starting to develop his fine art sculpture (what he calls his "suiseki art"). As his eye and sensitivity to the stone developed, he became dissatisfied with this suiseki. He was also paying attention to the contemporary daiza being shown in the Japanese suiseki magazines. The flat daiza does not complement the movement and feeling of the stone, and the stone and base don’t integrate – simply put, it’s not beautiful. So, he carved a new daiza paying careful attention to the movement of the stone. The aim is to take two beautiful objects – a stone from nature and a daiza carved by the artist – and marry them to create the finished piece. The stone itself is just a stone. The daiza by itself is just wood carving. Together they make art, a suiseki. 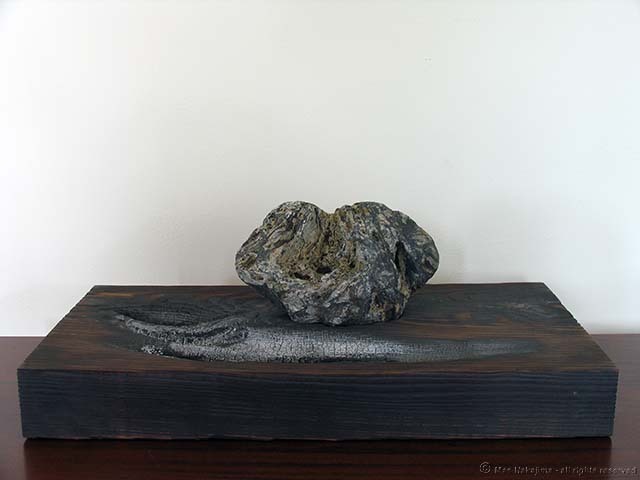 The fine art sculpture and the traditional suiseki are never in conflict for him, but are aspects of the same thing. His art is grounded in the practice of suiseki, and he constantly comes back to making suiseki to refresh himself. 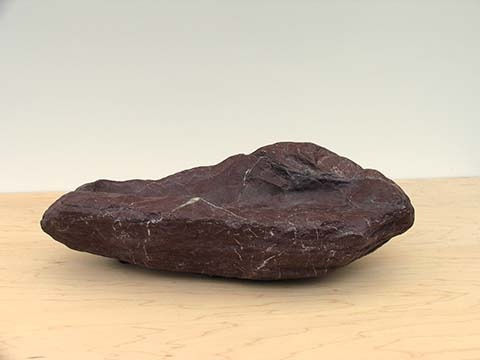 To me, this stone comes to life when cradled in the daiza – the curves in the rim bring out the movement and feeling of the stone. But note also the legs – they are larger than the traditional legs, and are not uniform. Each leg is made so as to echo and balance lines in the stone and thereby complement it. Instead of disappearing due to small size, the legs visually merge with, and help complete, the composition. Mas says that this suiseki was the first step towards achieving his dream of suiseki becoming fine art. 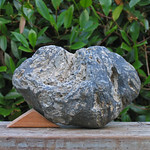 I found this stone on the Klamath River, and left it in the yard for over 10 years in the wind, rain, and sun. I was expecting that this process, known as youseki, would clean up the stains and show the beautiful white snowy mountain. But after 10 long years there was little color change – in particular the gray did not change to white. The years of youseki instead gave it a wabi-sabi and aware feeling. Wabi-sabi in suiseki is an antique and rusty look, and aware is a feeling of pathos, sorrow, misery, and wretchedness all combined. (These are very important ideas in Japanese art and do not translate to English very well). What could I do with such a sad feeling stone? I had no motivation to finish this stone as a suiseki, but I kept noticing and looking at the stone. Shortly after 9/11/2001 this stone caught my eye again – it reminded me of the collapsed twin towers. I wanted to use 4×14 Douglas Fir, which is very commonly used as a structural beam in a building. I chose this piece since both the proportions and the grain seemed to complement the stone. I tried to position the stone very carefully, looking at the wood grain as well as the overall balance and composition. After setting the stone, I carved a deep hole and burned the wood with a blow torch. This is the first time in my suiseki art that I went beyond just staining and polishing the wood. The stone has to me a feeling of total destruction, and I have tried to use it to express the deep sadness of that day. I was raised in a traditional wooden house in the countryside of Gifu, near the Japan Alps. Our house had three tokonoma (formal display alcoves) in various parts of the house. The tokonoma was a little space for sharing art with family and guests. This fit into the Japanese lifestyle of sitting on the tatami floor, perhaps enjoying the garden through the shoji or the paintings on the fusuma screens. My mother enjoyed her job of making the tokonoma displays, including selecting the seasonal flower arrangements, matching scrolls and other accompanying objects. This was part of the hospitality, along with serving the tea and cookies. Our family really enjoyed and appreciated her artistic displays. 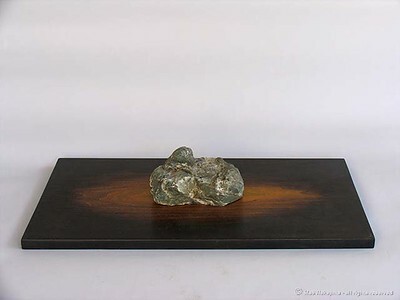 I had been thinking to display this stone in a douban (antique copper suiban) as an isogata ishi or shore stone, perhaps accompanied by a scroll of birds flying. However, the house I built here in California did have a tokonoma, but in a western style living room, along with fireplace, couches and tables. There was no tatami floor and we sat on the couches instead. I tried suiban display and scroll in this contemporary tokonoma many times, and was never satisfied. Probably the atmosphere didn’t feel right and I couldn’t get the same joy and excitement that I used to share with my mother. In English there is the saying that “you can never go home again”, the reality never matches your memory. At this time I had started feeling so lonely, living in the big house. My four children had all left home for college, and the distance was growing between my wife and me. I wanted to express my feelings through my art, but in a way that suited my American style of living. Lonely guy sits with his memories in the darkness, struggling to move forward. The moon lights his way with a smile. You are currently browsing the Suiseki Art blog archives for July, 2007.